Pictomod3D creates textured 3D mesh models from images of real objects. It takes either a rotated scan of an object or a few images from arbitrary angles, and outputs 3D objects in Wavefront OBJ or DirectX X file format. Pictomod3D is for rapid prototyping of new models and for people who want to create models. Use images of a rotated toy, or views of an object taken from arbitrary angles. Choose your output resolution, up to 128 000 polygons. ...... Increase the number of 3D models you can fabricate. Integrates easily into your mesh sculpting process. Fast, affordable and simple to use, leaving you more Time, Money, and Creative Energy. Use images of a rotated toy, or views of an object taken from arbitrary angles. Choose your output resolution, up to 128 000 polygons. Rapid prototyping for Ready To Use Texture Mapped Models. First collect your BMP or JPEG images, or extract them from MPEG or AVI files with the FrameExtractor utility. 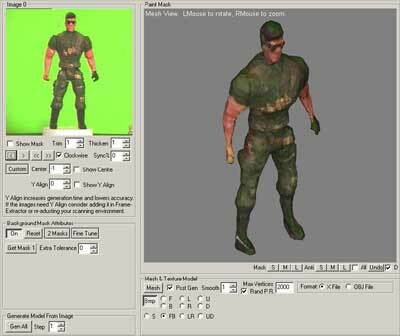 Select background mask, paint in any additional masks. Save the textured 3D mesh in either OBJ or X file format. Qweas is providing links to Pictomod3d 1.1 as a courtesy, and makes no representations regarding Pictomod3d or any other applications or any information related thereto. Any questions, complaints or claims regarding this application Pictomod3d 1.1 must be directed to the appropriate software vendor. You may click the publisher link of Pictomod3d on the top of this page to get more details about the vendor.